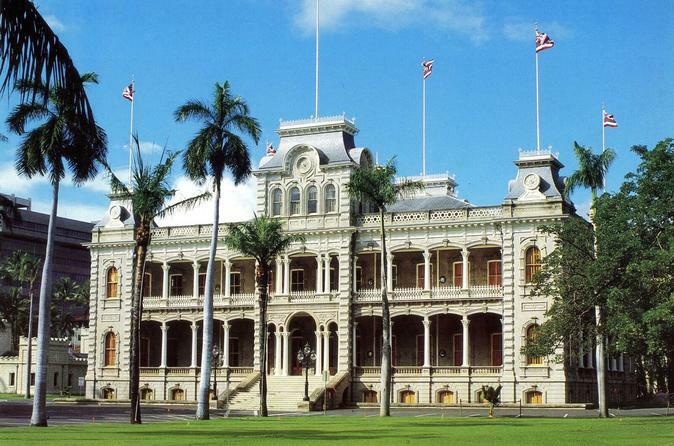 This incredible experience allows guests to walk the halls of ‘Iolani Palace, the only royal residence on US soil, where the Hawai‘i's ali‘i (royalty) lived, entertained and where its' last reigning monarch, Queen Liliu‘okalani was imprisoned! After that your air-conditioned mini bus takes you to world-famous Bishop Museum, home to the largest collection of Hawaiian and Pacific objects in the world! Guided experiences bring to life through stories and object life in Hawai‘i, our people culture and the ali‘i who ruled these islands. Total tour time from pick up to drop off 6.5 hours. The Monarch’s Tour provides an incredible overview of both the history of Hawaii and its people, as well as an opportunity to explore amazing Polynesian artifacts and interactive exhibits. This 6.5-hour excursion combines a visit the only official residence palace in North America and the museum widely considered to be the 'Smithsonian of the Pacific'. Enjoy pick-up from a pre-designated Waikiki spot at 8 am, joining your small group of fellow tour participants for a drive to 'Iolani Palace. Once here, embark on a 50-minute docent-led walk through this former home of Hawai'i's last monarch, Queen Liliuokalani. Meet your tour driver afterward for your next stop: Bishop Museum, “the Hawaii State Museum of Natural and Cultural History.” Museum staff will greet you upon arrival and bring you directly to the Bishop Museum Café for your pre-selected lunch. You’ll then have time to explore the museum at your leisure. There are also 4 distinct tours taking place during your visit that you are welcome to join. At 1:45 pm join your driver once again for the trip back to Waikiki. You should arrive between 2:30 and 2:45 pm. *Please note the lunch option for each traveler in the Special Requirements field at checkout.